KATAKLYSM - MEDITATIONS | Releases | Wizard LTD.
«, mirrors the emotional elements of these robust and vigorous sounds, while the incredible artwork (designed by artist Suzy Iacono) visually reflects the emotional torment and sonic release that the songs on the album portray. With KATAKLYSM’s classic symbol reflecting the clouds in the sky, a human face is seen struggling from inside the roots of a tree; screaming and struggling to escape. The washy colors set the tone for an intense and effective batch of musical measures. Strong songs like ‘Guillotine’ and ‘Outsider’ are sure to be die-hard fan pleasers with their classic KATAKLYSM sound and as they “are very intertwined with KATAKLYSM’s message,” says Iacono. 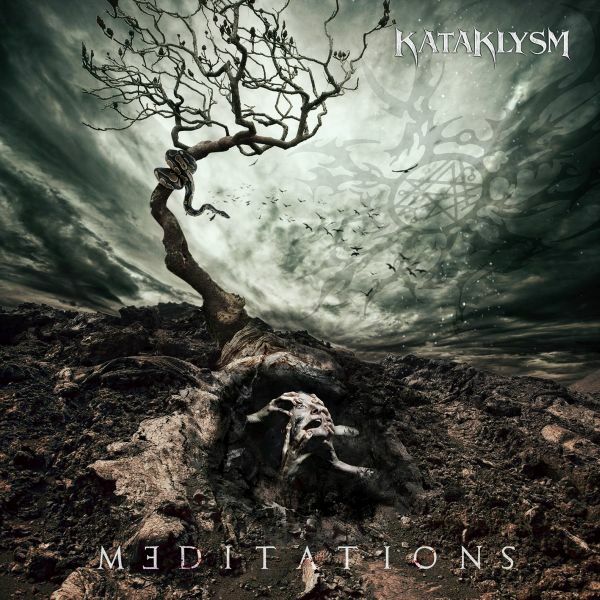 »Meditations« is a refreshing representation of both the roots and foundations of KATAKLYSM. It represents the duality of various essences in the realm of truly existing as an Outsider. It is something which will electrify consistent KATAKLYSM fans, welcome new ones, and reawaken old ones.